The EPS Speech Team traveled to the Howells-Dodge Invite on Wednesday, January 28. The team faced some tough competition during their season opener. The varsity division consisted of fifteen teams. EPS and the host team were joined by Columbus Lakeview, Boone Central, Humphrey, Clearwater-Orchard, Twin River, Leigh, Wakefield, Oakland-Craig, Lyons-Decatur, Clarkson, Plainview, Cedar Bluffs and Newman Grove. 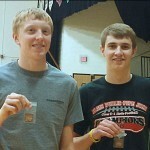 Ethan Fisher and Kenny Bush emerged as medalists. They placed 3rd out of 28 teams in duet acting. The duet of Zoey Bergman and Alois Warner narrowly missed finals by one place and earned a superior rating. Superior ratings were also earned by the following: Lisa Dohmen-Humorous Prose, Tyler Smith-Entertainment, Katie Polk-Serious Prose, Dylan Widger-Poetry and Morgan Carpenter–Humorous Prose. Excellent ratings were earned by Bergman, Widger and Taya Voborny-OID, Jaime Hoefer-Serious Prose, and Christopher Bush, Kenny Bush, Warner and Hoefer-OID. Coaches Stacy Shumake-Henn and Jessie Reestman praised their team’s efforts.